Late last week, the board of one of Europe's largest airlines gave approval for the purchase of 27 short and medium-haul aircraft, with a list value of around $3billion. 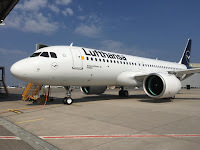 That board was the supervisory board of Deutsche Lufthansa AG and they approved the purchase options for 24 Airbus A320neo and three A321neo the airline held will be converted into firm orders. With this decision, the Lufthansa Group is reacting to the positive market and earnings development and thus ensuring the necessary fleet size in the coming years. The total value of the order is around three billion US dollars at list prices, although as Lufthansa is a special customer of the European manufacturer, the real price will be much lower. The new order increases the total number of A320neo and A321neo orders to 149 for the Group, 13 of them are already operating with Lufthansa. The A320neo and A321neo are scheduled for delivery in 2023 and 2024. Ten of the 27 new aircraft are intended for SWISS, the remaining aircraft will be in service by other flight operations within the Aviation Group. One part of the order will be equipped with Pratt & Whitney engines (PW1100G), the other with LEAP-1A engines from CFM International. This means that both engine types will continue to be available to the Lufthansa Group in roughly equal proportions for the “Neo” family. The innovative engine technologies developed by Pratt & Whitney and CFM International as well as the aerodynamic wingtips (sharklets) with which the aircraft are equipped to reduce fuel consumption significantly by up to 20% per seat kilometre Lufthansa A320 Family aircraft, the A320neo and A321neo are serially equipped with noise-reducing vortex generators. An A320neo taking off has a noise carpet that is around 50 % smaller than that of other aircraft of this type. Lufthansa continues its massive expansion of slowly controlling a vast swathe of the European aviation industry, these new aircraft are just the next little step on the road to becoming the most dominant airline group in Europe.